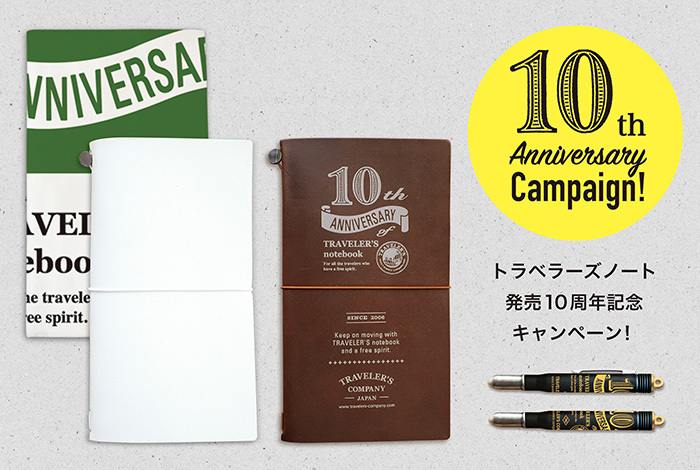 TRAVELER’S notebook 10th Anniversary Present Campaign! *This campaign has been closed. There is chance of winning “TRAVELER’S notebook 10th Anniversary Item” by applying using a postcard included in the 10th Anniversary Limited Can Set! From March 2016, TRAVELER’S notebook has experienced 10 years of history since its launch in 2006 with a core message of “traveling through one’s daily life.” The notebook itself is slightly laborious and cumbersome to have, but we were able to make this notebook for ten years thanks to all the users who have used it with love. Thank you very much. 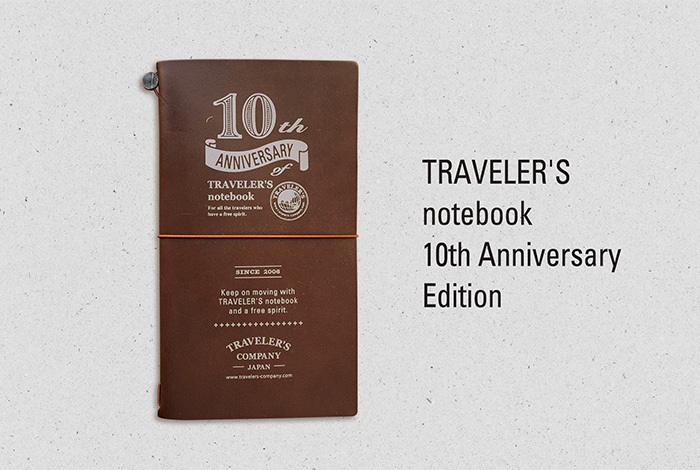 “TRAVELER’S notebook Mini 10th Anniversary Can Set” was made to celebrate the 10th anniversary of TRAVELER’S notebook. 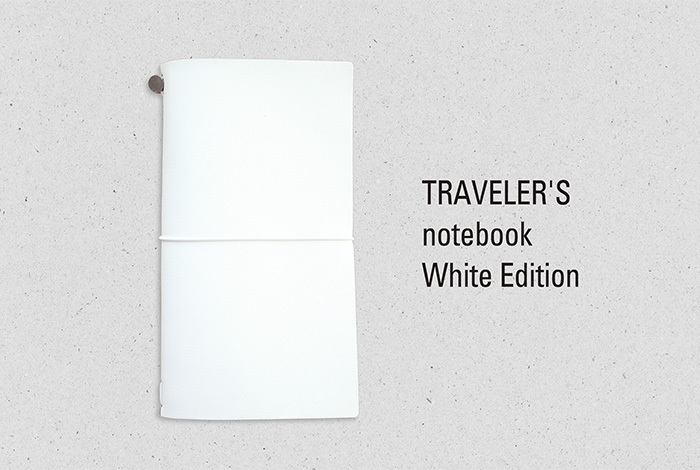 This is an item for people who use TRAVELER’S notebook as their partner to travel through their daily life. To express appreciation towards these users, there is a mini size TRAVELER’S notebook, customizing item, a 10th anniversary guide, and a 10th anniversary campaign application postcard set inside the can. By filling in this application post card, there is a chance of winning TRAVELER’S notebook White Edition and other limited items made for this campaign. TRAVELER’S notebook White Edition was a prize for the very first post card campaign in 2007, and this will be a limited reproduced version to celebrate the 10th anniversary. 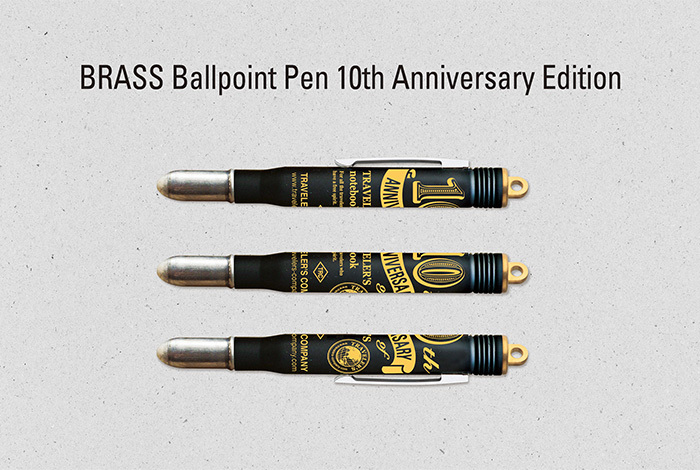 “TRAVELER’S notebook 10th Anniversary Edition” and “BRASS Ballpoint Pen 10th Anniversary Edition” will be a limited item with a 10th anniversary logo being applied. Also, there will be “Tenugui (Japanese hand towel) 10th Anniversary Edition” prepared, which is made in a factory located in a historical district of Tokyo, where traditional processing method is applied in the manufacturing and dyeing process. People can apply to this campaign by choosing one of their favorite items. On the application post card, there is a space to write down a message towards the 10th anniversary of TRAVELER’S notebook. We will introduce the message on our website, so please let us hear your voice! *The photos on this page are an image. Please be noted that the actual product may differ from the image. 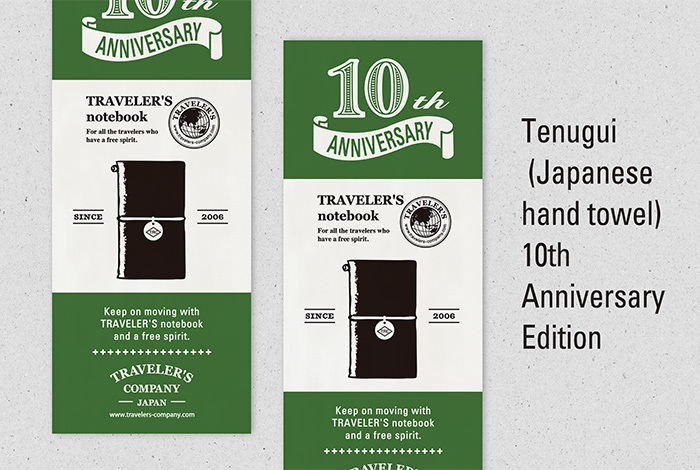 An application post card included in TRAVELER’S notebook Mini 10th Anniversary Can Set. Please be noted that we will not accept other types of application form other than the one included in the set. The items are planned to be sent on April 2017. Winners will receive the item without prior announcement. On the post card, there is a space to write a message. We are looking forward to seeing the passionate message from our users. – We will not accept other types of application form, and please note that we will not accept applications using other post cards. – Please write down all the information in English. – The transfer of the right to win the prize to another person is strictly prohibited. – Winners will receive the items without prior announcement. – The items are planned to be sent on April 2017. – Since this present campaign will be hosted, there will be no “TRAVELER’S Postcard Campaign” in 2016. – The personal information sent from the users will be used make contacts related to this matter, if any, and for statistical purposes such as identifying the kind of user in a way that does not specify the individual. – Excluding personal information such as name and address, we may use the content of the post card for our website or sales promotion. Also, it will be used as a reference when designing goods. When the information is used in the cases above, intellectual and other related properties will belong to Designphil Inc. Please be noted of this when applying. – The personal information sent from the users will be kept strictly confidential. Unless the information is required to be disclosed by law, Designphil Inc. will be responsible in managing the information, and will not release the information to third party without any approval from the user.